Week two of the People vs. Dr. Conrad Murray Hollywood trial introduced the world to a new cast of characters. The witnesses were made for great TV. They were colorful, brilliant, arrogant, frustrated, pretty and aloof. Week two of the Michael Jackson manslaughter trial was reality TV worth watching. Dr. Conrad Murray, 58, a cardiologist and Michael Jackson's personal doctor, is on trial for involuntary manslaughter. Prosecutors say he criminally breached medical standards and "repeatedly acted with gross negligence" by giving Michael Jackson a fatal dose of the surgical anesthetic propofol for insomnia, causing "acute propofol intoxication." Los Angeles County coroners office also determined that Lorazepam contributed to Michael Jackson's sudden death on June 25, 2009. Week one's testimony outlined Dr. Murray's actions after he realized his patient was not breathing, and the testimony continued to shine light on the doctor's actions up until the time that he arrived at UCLA hospital with Michael. Week one ended with paramedic, Richard Senneff testifying that Michael Jackson could have been saved, but for the fact that Dr. Murray gave him false information when he arrived at the scene. Week two's testimony picked up where week one left off, in the emergency room. Two emergency room doctors, Dr. Richelle Cooper and Dr. Thao Nguyen detailed Michael Jackson's emergency room care, their interactions with Dr. Murray and the final pronouncement of the King of Pop's death. The prosecution then shifted the jurors' attention to Dr. Murray's actions before he realized his patient had stopped breathing. They tunneled in on where Dr. Murray was and for how long he was away from Michael Jackson. The end of week two's testimony focused on the investigation of the crime scene and the toxicology results stemming from the evidence secured from the scene. The most powerful prosecution's presentation of week two came from the complete audio rendering of Michael Jackson's drugged-induced conversation with Dr. Murray. To close out the week, the prosecution played a portion of Dr. Murray's recorded statement to the police given two days after Michael Jackson's death. The jurors were dismissed for a long holiday weekend with the words of Dr. Conrad Murray ringing in their ears. From week two's testimony we learned that upon the paramedics' arrival at Michael Jackson's home, they found no pulse and no signs of life at 12:27 p.m. After trying to resuscitate Michael for the procedurally required 20 minutes without any change in his condition, they contacted Dr. Cooper, who was in charge of the UCLA emergency room. Based on the provided information, Dr. Cooper wanted to pronounce Michael Jackson dead "in the field" at 12:57 p.m. However, Dr. Murray pleaded for Dr. Cooper to delay the pronouncement of death and agreed that he would travel in the ambulance with Michael Jackson and lead all resuscitation efforts. The ambulance arrived at the hospital at 1:13 p.m. The emergency room staff and other specialist gave Michael Jackson "VIP" treatment in a desperate effort to bring him back to life. Dr. Cooper testified that Michael was clinically dead at 12:57 p.m. and therefore, he was dead when he became her patient. Finally, at 2:26 p.m., Michael Jackson was pronounced dead. Dr. Cooper testified that she attempted to comfort Michael Jackson's "fairly hysterical" children in the waiting room with little success. The testimony of the brilliant E.R. doctor Thao Nguyen, who detailed a frantic, yet evasive Dr. Murray, was captivating. Her entrance to the witness stand, in an Issey Miyake-ish outfit caused a corporal gasp within the courtroom. She did not look like a typical doctor. Yet, her fabulous fashionista sense paled in comparison to her genius. She was unfazed by the defenses aggressive cross-examination and shared her concerns about Dr. Murray's inability to give a timeline relating to the sequence of events at the crime scene. Dr. Cooper and Dr. Nguyen both testified that Dr. Murray did not state that he had given Michael Jackson propofol. He stated that he had only given him Larazapam as a sleep aide. Next, the prosecution provided witnesses' testimony suggesting that Dr. Murray was away from his patent for at least 45 minutes managing his private practice business, sending detailed emails regarding Michael Jackson's health to insurance companies, and engaging in personal phone calls. The prosecution called to the stand three women who communicated with Dr. Murray on June 25, 2009. Each of the women, all former strippers/exotic dancers, who met Dr. Murray in a gentlemen's club atmosphere, thought that she was Dr. Murray's girlfriend on June 25, 2009. Ms. Nicole Alverez, 29, an aspiring actress and the mother of Dr. Murray's two year old son, was living with him on June 25, 2009 and continues to do so at this time. The women were called as prosecution witnesses because their phone numbers were retrieved from one of Dr. Murray's two cell phones. Ms. Sade Anding was on the phone with Dr. Murray when the prosecution believes that Dr. Murray returned to his post to find a non-breathing Michael Jackson. A very well spoken and likeable, Ms. Anding, testified that she was speaking with Dr. Murray and then realized that he was not responding to her statements. She testified that she then put the phone closer to her ear and could hear noises. She said that it sounded like coughing in the background , although on cross-examination, she testified that she could not decipher anything she heard. After about six minutes of being ignored, Ms. Anding hung up the phone. Based on phone records and consistent with Ms. Anding's testimony, Dr. Murray retuned to Michael Jackson's bedroom at approximately, 11:50 a.m.
Week two's most dramatic and surreal moment came upon the hearing of the audio of an intoxicated and slurring Michael Jackson, recorded on Dr. Murray's iPhone, on Sunday, May 10, 2011 at approximately 9:00 a.m. Very wisely, many of the Jackson family members opted not to attend that day in court. I would have been distraught to hear my loved one share his deepest desires with a man that I believe killed him. Despite the fact that Dr. Murray deleted this recording, as well as, several emails recently moved into evidence, experts were able to easily retrieve the data. (Mental note to myself -- never use an iPhone for unscrupulous matters.) On the emotional audio, Michael shared his dream to build a hospital for one million children. He said, "God wants me to do it." Michael continued, "I'm gonna do that for them. That will be remembered more than my performances. My performances will be up there helping my children and always be my dream. I love them. I love them because I didn't have a childhood. I had no childhood. I feel their pain. I feel their hurt. I can deal with it. Heal The World, We Are The World, Will You Be There, The Lost Children. These are songs I've written because I hurt, you know, I hurt." The jurors were noticeably moved by this recording. Who wouldn't be? The King of Pop confessed, "I hurt." Often times in a manslaughter case, the testimony becomes so medical, scientific and forensic that the dead victim is forgotten. With the playing of this tape, the prosecution brought Michael Jackson back in to the courtroom and to the forefront of the jurors' minds. Friday afternoon, the prosecution began to introduce into evidence Dr. Murray's two hour statement to the police. His attorney, Ed Chernoff was present during the statement. Mr. Chernoff has been powerful in his cross-examinations up to his point, but I don't know why he allowed his client to give a statement to the police. In the portion presented to the jurors thus far, Dr. Murray stated "What I was recognizing was (Michael Jackson) might have had a dependency to a substance." He added "I was trying to wean him off." Dr. Murray told the police that he tried numerous methods to put Michael to sleep on the morning of June 25, 2009 but nothing seemed to work. After 10 a.m., Jackson told Murray, "Please give me some milk so I can sleep because I know that's all that works for me." Milk is Michael Jackson's nickname for the creamy white Propofol. Rebbie Jackson became so emotional upon hearing Dr. Murray's statements that she left the courtroom. In her haste, she walked into the galley near the jurors, and this resulted in a strong admonition from Judge Pastor. With about 75 percent of Dr. Murray's statement played, the court recessed until after the Columbus holiday break. I have always wondered if Michael Jackson was watching television that fateful morning of June 25, 2009 and learned that Farrah Fawcett died at approximately 9:30 a.m. PCT. If Dr. Murray's testimony is true, Michael was spared the sadness of learning that Farrah Fawcett lost her long fault battle with cancer. The scene outside of the courtroom during week two hasn't changed much from week one. There are still the Michael Jackson fans sitting on the hard benches and floor watching the trial on their iPads and Smartphones because they could not gain entry into the courtroom via the lottery process. I love when I have time between my on-air Trial Analyst position for Los Angeles' KTLA News, to run from the 12th floor media room to the 9th floor and speak with true Michael Jackson fans. Fans who have told me that they will be at the courthouse everyday of the trial. Fans who have traveled from other countries and other states. Fans who have quit their jobs so they could "camp out" in Los Angeles to support the Jackson family. Yes, real fans are the people with whom I love to spend my free time -- I find them fascinating. I was recently reminded that Merriam-Webster, the Oxford dictionary and other recognized sources define the word fan as a shortened version of the word fanatic. And Fanatic itself, means "marked by excessive enthusiasm and often intense uncritical devotion." Well, I had to pleasure to interview a Michael Jackson fanatic -- and if there was a term to describe an even greater level of devotion, Sharon Sydney would be just that. Sharon, a devout Bible reader, is different from most Michael Jackson fans who are still mourning his death because she is convinced that Michael Jackson is alive. Despite the fact that Sharon has attended everyday of this trial; has seen Michael Jackson's grey motionless body on the gurney; has heard the witnesses state that Michael Jackson's daughter Paris screamed "Daddy" as she kneeled next to her dead father's body; has heard the emergency room doctors testify about the hour of useless and unsuccessful resuscitative attempts; has heard the toxicologist testify as to what drugs where found in Michael Jackson's body during the autopsy; she still believes that Michael Jackson is alive. In great detail, Sharon explained to me why and how Michael Jackson was kidnapped from his home. She is convinced that Michael Jackson is being held hostage - and get this: she believes that Michael Jackson is being forced to record hits. Sharon offered evidence that she believes proves that Michael Jackson, is in fact, finishing all the music that music executives have recently released as studio enhanced songs of Michael Jackson's unfinished material found in his catalog. Sharon Sydney is a fan that met Michael Jackson in Gary Indiana in 2004. She was honored to give a speech at an event where Michael Jackson received the keys to the city. Sharon said that the "Holy Spirit" guided her to her "relationship with Michael Jackson." She claims that she "knows" Michael and has had numerous telephone conversations with him. Ms. Sydney is reluctant to go into detail about their relationship but she assures me that she and Michael Jackson were friends. Sharon opened up and said, "God showed me that people were coming to take his life." Upon that revelation, she left her home and job in Texas and relocated to California to be with Michael. Everyday, Sharon attended Michael Jackson's child molestation trial in 2005 , and it was there that she befriended Mrs. Katherine Jackson and Joe Jackson. Sharon always managed to create time in her Los Angeles employment schedule to, as she stated, "check on Michael." She has been to Michael Jackson's home, Carolwood , dozens of times. Sharon was one of the fans, as testified by Kenny Ortega, who attended many rehearsals for This Is It, at all three venues. What intrigued me most about Sharon Sydney's story is the fact that she was at Carolwood on June 25, 2011, the day Michael Jackson died. One the evening of June 24th, she was at the rehearsal venue, Staples Center, and beat Michael Jackson's car back to his home. In fact on June 24th she was able to give Michael Jackson's security personnel letters and gifts from some of his fans; her friends. She and other fans camped out all night, as they had done on numerous occasions. But Sharon said she knew something was wrong. She says, there were strange cars at Michael Jackson's mansion on the night of June 24th. She felt that something covert was taking place. Ms. Sydney was at the gate of Carolwood on June 25, 2009 when the ambulance arrived. She watched it leave and then followed it to the hospital. Sharon claims that it was she, who notified Joe Jackson that someone was being taken from Michael Jackson home in an ambulance. She tried to call Mrs. Jackson but was unable to get through. When she learned at the hospital that it was purportedly Michael Jackson being rushed in, she called and spoke with Joe again. Sharon tells of her attempts to get Michael Jackson's security personnel at the hospital to speak to Joe Jackson on the phone, but they yelled at her and threatened to have her arrested. She tells of how, at the hospital, she spoke with paramedic Blount, and how they both agreed that the person that was wheeled into the hospital was not Michael Jackson. Sharon is adamant that the patient wheeled into the emergency room was much shorter than Michael. She was very upset that paramedic Blount told a completely different story when he testified for the prosecution and detailed how he and his partner handled Michael's resuscitation efforts at Carolwood. As I shared Ms. Sydney's kidnapping theory with my eight and seven-year-old daughters, they could not hold back their chuckles. Tryumph and Whizdom became huge fans of Michael Jackson after his death and after watching This Is It four times. My eight year old said, "we all want Michael Jackson to be alive but the truth is -- he's dead, Mom." I couldn't have said it any better. On the streets outside of the courthouse there are still a handful of Michael Jackson fans who come to see the Jackson family arrive and shout out their words of support. There are wanna-be stars who come in the hopes that Jane Valez-Mitchell will interview them on live TV, and thus launch their movie star careers. There are a couple of Dr. Murray supporters, but most often you only see one women, Beatrice Fakhrian. She is a friend and fellow parishioner at Dr. Murray's Los Angeles church. She has been on the streets declaring Dr. Murray's innocence since the trial began. Ms. Fakhrian, a Beverly Hills entertainment executive, holds two signs but has a couple extra signs to give to anyone who is wiling to stand behind the yellow plastic divider that is designated for Dr. Conrad Murray's supporters. Friday of week two, on the street, had me in stitches. As I walked up the stairs from my 8 a.m. "hit" on KTLA, I saw a sign where Michael Jackson's supporters stand that read "Got Milk." My twisted mind thought that someone creative was "referring to propofol." 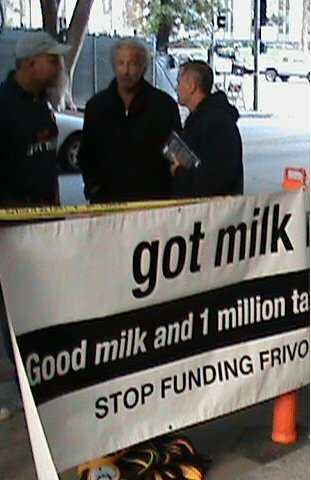 When I was close enough to read the entire sign, I realized that Michael Jackson's supporters had been joined, behind their yellow plastic divider, by a group supporting their friends who were charged with a felony for illegally selling unpasteurized milk, also known as Raw Milk. This group was boisterous and excited to tell me why raw milk is much healthier than the "stuff" we buy in the stores. This group of supporters far outnumbered Michael Jackson's supporters that day but in my mind, they were all standing behind the yellow plastic divider in passionate unison telling about the harms of "Milk."